Heparin is a direct anticoagulant. It belongs to thrombin inhibitors and is a major tool for the treatment of arterial and venous thromboses of different etiology. Heparin is a mixture of high molecular weight sulfated mucopolysaccharides. It is most often used subcutaneously or intravenously. After oral intake, it is inactive and is not absorbed. Because of its large molecule, the heparin does not cross the placental barrier and is not excreted in breast milk. It is effective and safe for use during pregnancy and lactation. 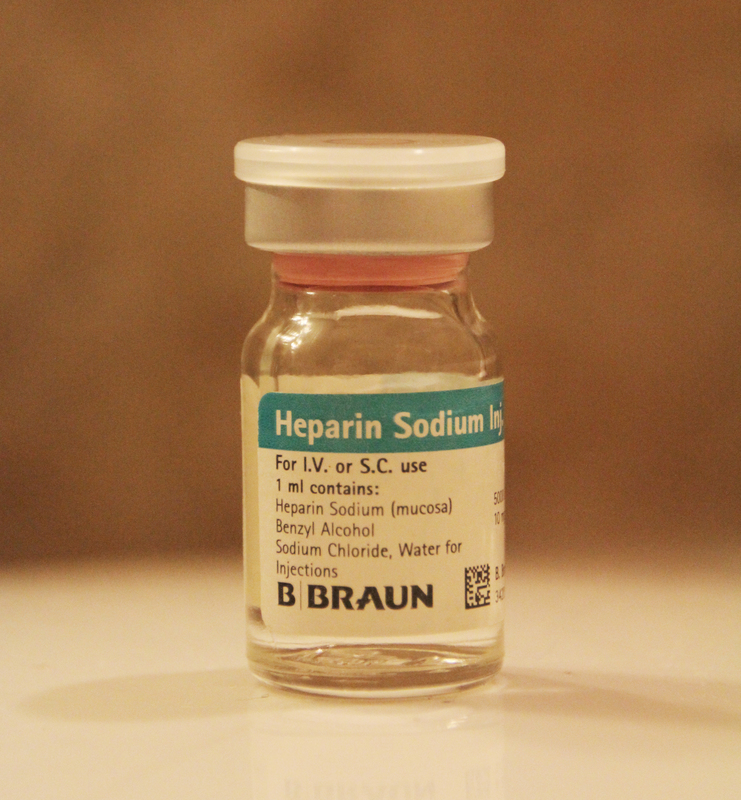 Heparin is biotransformed and disposed of in the liver and is eliminated from the body by the kidneys. maintenance treatment following fibrinolytic therapy with streptokinase, etc. One of the serious side effects of heparin is the development of thrombocytopenia. hypersensitivity reactions occurring most often with urticaria, fever, redness. Low doses pose a risk of activation of thrombosis processes, while overdose is likely to develop hemorrhages. Warfarin (4-hydroxycoumarins) is an indirect anticoagulant. After oral intake, warfarin is rapidly and completely absorbed from the gastrointestinal tract. Warfarin is metabolized in the liver and has a long plasma half-life, which predisposes to cumulation and development of toxic reactions. The main effect of warfarin is inhibition in blood clotting. It falls into Risk category X, which means that the risk of its use considerably exceeds the expected benefit. It ejects with the breast milk and passes through the placental barrier. When using this preparation during pregnancy a characteristic dysmorphism develops. A number of organs and systems are affected, mainly the central nervous system, the locomotory system, the cardiovascular system, the eyes. The clinical effect occurs after 12 to 72 hours. The main indications for the use of warfarin include prophylaxis of venous thrombosis and pulmonary thromboembolism. It is also used after a myocardial infarction, to prevent a recurrence of the condition, and after heparin therapy. During therapy, periodic monitoring of certain parameters is required due to the small difference between the maximal therapeutic and minimal toxic dose. There is a significant risk of overdosage and development of intoxication. The low dose can cause thrombosis, while overdose causes hemorrhages. A specific antidote and antagonist of warfarin is vitamin K.
skin rash, pruritus, dermatitis, vasculitis. With prolonged intake, the preparation is hepatotoxic and leads to impairment of liver function. The effect of warfarin is enhanced by cimetidine, chloramphenicol, metronidazole, some broad-spectrum antibiotics. A decrease in the effect is caused by barbiturates, estrogens, vitamin K, cholestyramine. Heparin: Heparin is a direct anticoagulant. It is a mixture of high molecular weight sulfated mucopolysaccharides. Warfarin: Warfarin is an indirect anticoagulant. It is an organic compound (4-hydroxycoumarins). Heparin: Prevents the correct work of fibrin and thrombin. Warfarin: Prevents the correct work of vitamin K.
Heparin: Heparin works faster than warfarin. It is recommended when an immediate effect is needed. Warfarin: Warfarin works slower than heparin. The clinical effect occurs after 12 to 72 hours. It is recommended for a long-term therapy. Heparin: Heparin is given as an injection (subcutaneously or intravenously). After oral intake, it is inactive and is not absorbed. Warfarin: Warfarin is used in tablet form. After oral intake, warfarin is rapidly and completely absorbed from the gastrointestinal tract. Heparin: Because of its large molecule, heparin does not cross the placental barrier and is not excreted in breast milk, making it effective and safe for use during pregnancy and during lactation. 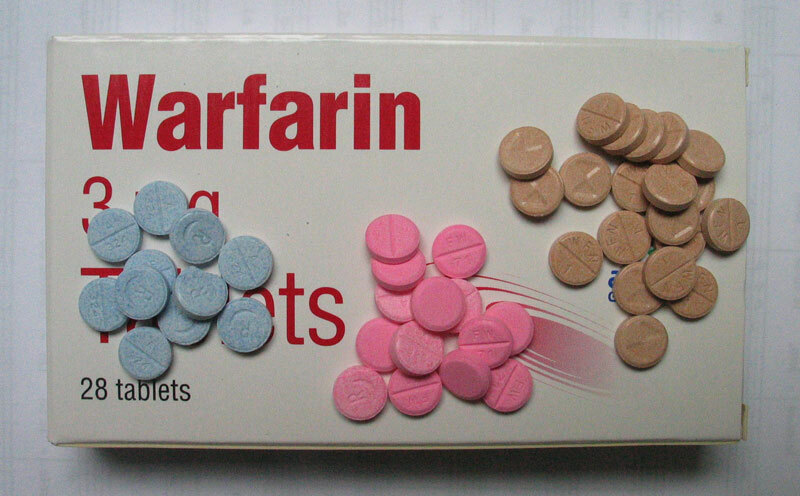 Warfarin: Warfarin penetrates in the breast milk and passes through the placental barrier. The use of this preparation during pregnancy leads to the development of a characteristic dysmorphism. Heparin and warfarin are both used as anticoagulants, in order to decrease the development of blood clots. Heparin is a direct anticoagulant. It is a mixture of high molecular weight sulfated mucopolysaccharides. Warfarin is an indirect anticoagulant. It is an organic compound (4-hydroxycoumarins). The low dose of both anticoagulants can cause thrombosis, while overdose causes hemorrhages. Heparin prevents the correct work of fibrin and thrombin, while warfarin prevents the correct work of vitamin K.
Heparin works fast and is recommended when an immediate effect is needed. The clinical effect of warfarin occurs after 12 to 72 hours. It is recommended for a long-term therapy. Heparin is given as an injection, while warfarin is used in tablet form. Because of its large molecule, heparin does not cross the placental barrier and is not excreted in breast milk, making it effective and safe for use during pregnancy and during lactation. Warfarin penetrates into the breast milk and passes through the placental barrier, causing a characteristic dysmorphism. Dr. Mariam Bozhilova Forest Research Institute, BAS. 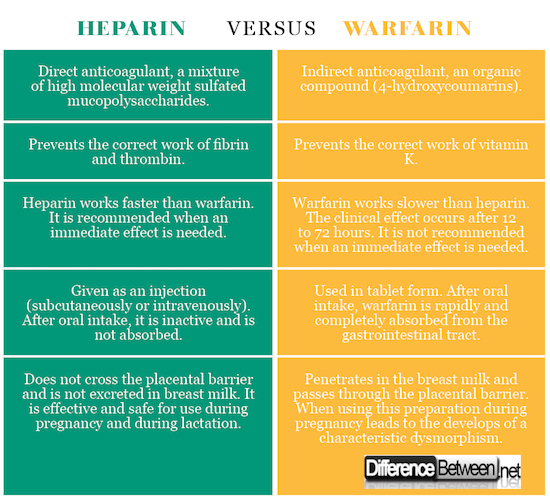 "Difference Between Heparin and Warfarin." DifferenceBetween.net. February 26, 2018 < http://www.differencebetween.net/science/health/drugs-health/difference-between-heparin-and-warfarin/ >. Blake V. Warfarin & You. Newfoundland: Taylor Day Publishing. 2010. Print. David L., I. Björk, U. Lindahl (Eds.). Heparin and Related Polysaccharides. Berlin: Springer. 1992. Print. Rebecca, L., B. Mulloy, C. Page (Eds.). Heparin - A Century of Progress. Verlag, Berlin, Heidelberg: Springer. 2012. Print.